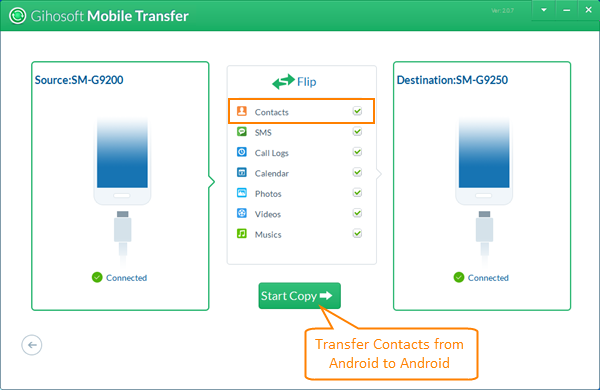 Method 1: How to Transfer Contacts from Android to Android Within Clicks? Method 2: How to Send Contacts from Android to Android Manually? Method 3: How to Import Contacts from Gmail to Android Phone? Method 1: How to Transfer Contacts from Android to Android Within a Click? Once you have installed Gihosoft Mobile Transfer on your computer, please launch it. Afterward, you will see the main interface. The free trial version can allow you to transfer 10 contacts from old Android phone to a new Android phone without any cost. Note: Gihosoft Mobile Transfer can also enable you to send contacts to Android from iPhone directly or from iTunes backup. Tap “Phone to Phone” and connect both your old and new Android phones to the computer via USB cables. Once the two devices have been connected to the computer successfully, the phone model name will be shown on the software interface. You can click “Flip” button to switch the source phone and destination phone. After the two Android phones have been detected by our software, please mark “Contacts”, then click “Start Copy” to copy contacts from Android to Android. When contacts transferring process is completed, you will be informed by a pop-up message. Now you can check the contact list on new Android phone. Copy old Android phone contacts to SIM card: go to “Contacts” -> tap on “More” -> choose “Export contacts” -> export to SIM card. Pull out the SIM card from old phone and insert it into the new phone. Import contacts from old Android phone to new Android phone: go to “Contacts” -> tap on “More” -> import contacts -> from SIM card. Then all your contacts will be transferred from old Android to new Android phone. Tip: If your contacts get lost or deleted by mistake, you can quickly recover them by using Gihosoft Free Android Data Recovery Software. If you have synced your contacts to Gmail account, that would make easier to move contacts from one Android phone to another. You’re supposed to sign in with the old Gmail account instead of setting up a new Google account on the new Android device. Follow the path above to add Google account on the new phone. When prompted for which account you want to add, tap “Google” and proceed with “Next” button. Then type the Gmail address and the password into the device. With the account added, tap on the Gmail account and tap “Sync” button. Then wait a while until the entire process is complete. After all this, you should see all the synced contacts on the new device. Besides the above 3 ways, you can also transfer contacts from Android to Android via SD card etc. If you want to move messages, please refer to how to transfer SMS from Android to Android.